Looking for an easy tasty treat to wow your guests? How about making some delicious meringue parfaits in ombre colors. Not only do these treats look like they stepped out of a fashion mag, but they taste out of this world. 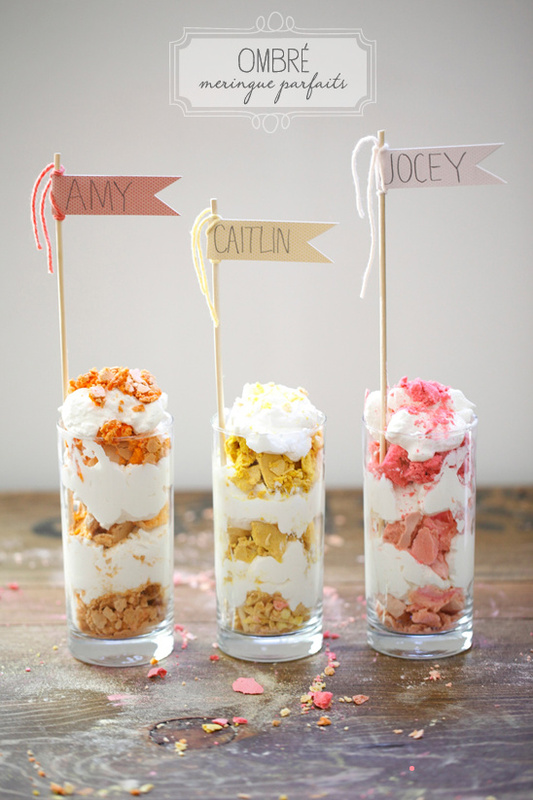 Our in-house culinary genius, Caitlin had us at hello with this sweet idea! Place a little personalized flag into the treat and you have one heck of a presentation. Yes...of course we will teach you how to make the flags. Read on to learn tow To Make Meringue Parfaits and wow your guests. Preheat your oven to 300 degrees. Line a baking sheet with parchment paper. Place your egg whites into the bowl of an electric mixer, making sure there are no egg shells or egg yolk in them. Using a whisk attachment on medium speed whisk the whites until they form firm peaks. With the mixer still running, gradually add the sugar and a pinch of salt. Turn the mixer up to to the highest speed and whisk for about 7 to 8 minutes until the meringue mixture is white and glossy. Test the meringue by rubbing a little between your fingers. If it feel at all grainy, mix for a little longer. Be careful not to over mix, otherwise it will collapse. At this point you can gently fold in a variety of different flavors. We used 1 teaspoon each of lemon zest and orange zest. Divide the batter into three parts. Add flavors and food coloring to create an ombre look. Spoon the meringue onto the prepared baking sheets. They do not have to be perfect since you will be crushing them later. Leave a little bit of space between them. Place them in the oven for about 1 hour, until the meringues are crisp on the outside and chewy and slightly gooey in the middle. While the meringues are baking make the whipped cream. In the bowl of an electric mixer whisk the cream on medium-high speed gradually add the sugar until soft peaks form. Add the vanilla. Assembling the meringue Once the meringues are cooled crush them up keeping your colors divided. In the bottom of a tall clear glass sprinkle the meringue then add a spoonful of the whipped cream. Continue until the glass is full. Garnish with more meringue crumbles or fresh berries, candied lemons or orange slices.